We have been pleased to provide ongoing support for Rutgers-Newark since the 2011 redesign. You can read more about that here. We have a long-lasting relationship with the campus and have been providing ongoing support for Rutgers-Newark for tasks ranging from bug-fixes to regular security updates on their Drupal site. We’ve also done a few separate rounds of major improvements: converting the site from a static/fixed width site to a responsive one and making the site more accessible for all users. 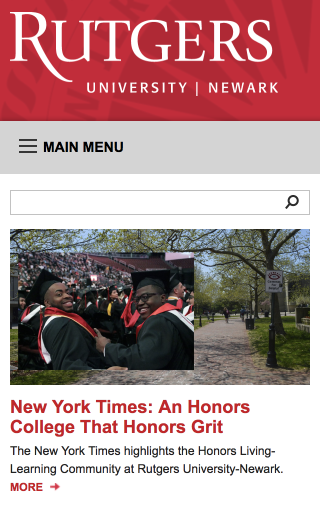 As compliance with web accessibility guidelines became increasingly necessary, improvements became a focus for Rutgers-Newark in that area and we were there to guide them through their options. Previously, a third party had done a full accessibility audit report. We organized the resulting tasks into an order that allowed us to efficiently perform the upgrades. Then we implemented those improvements to bring the site in line with university accessibility policies and WCAG level AA compliance.